A Loving Birth: Gift Certificates, Classes, Breech, Vit D and more! Gift Certificates, Classes, Breech, Vit D and more! Hello! I hope this blog post finds you well! We have started our bi-monthly meditations! It is so nice to take a moment, quiet your mind and connect with your baby. Having a baby growing inside you can feel so surreal. Taking a moment to slow down and make that conscious connection with your baby can make it all that more real and special! The next meditation is scheduled for Tuesday, October 13th at 5:30 pm. 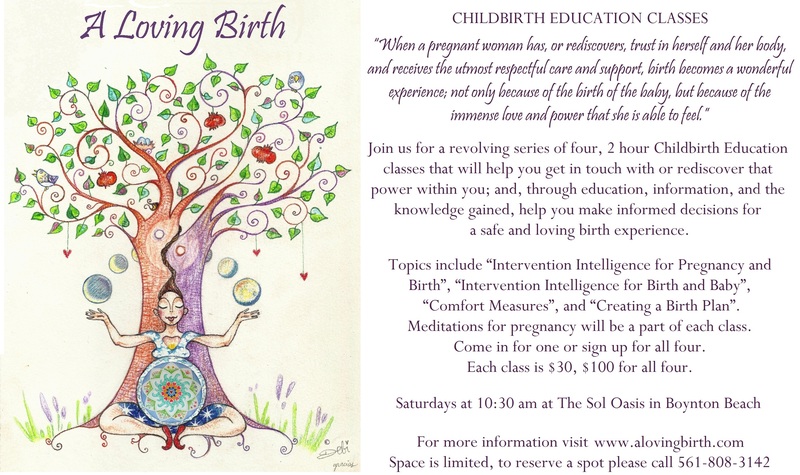 On Saturday October 10th we will be starting our 4 weekly 2 hour Childbirth Education Series. Can't make it this week? No worries, you can jump in at any time! But make sure you RSVP as space is limited. Please see below for mediation and class details. If it rains we will meet at The Sol Oasis in Boynton Beach. You must RSVP by calling 561-808-3142. The first class will be held on Saturday, October 10th at 10:30 am. A woman is 36 weeks and her baby is still breech (head up)... she is told it is not safe to deliver vaginally and that she needs a c-section... but is this true? Are there other options? According to the Society of Obstetricians and Gynecologists of Canada breech birth under the right care is safer than a c-section and has started to train their physicians in breech birth. Hopefully the US will follow suit soon. In the mean time there are obstetricians in South Florida, with knowledge and experience, willing to deliver breech births. So if you or someone you now is in this situation please know there are other and safer options. Contact me and I will be happy to help you navigate them. To learn more about the safety of breech births I leave you with the following links. There are also things that a mother can do to help her baby turn head down, www.spinningbabies.com is a great resource for that. More and more mothers are choosing to have a natural birth, and it is not surprising because the benefits for both mother and baby are many, and the risks for unnecessarily medicated births are real. So what are some things you can do to increase your chances of a natural birth? There are several, but today I will only touch on one. We discuss how to achieve a natural birth in my classes and it is part of the support I provide my doula clients (if they so choose). Today's tip: The choice in care provider is key in helping you achieve a natural birth. Your care provider will provide more or less support and make suggestions for interventions, or not. Depending on the type of care provider these interventions may be more or less necessary, and can be based more on their preferences and beliefs than on actual evidence. A good resource to help you make informed and evidence based decisions is www.evidencebasedbirth.com But keep in mind there is still a lot we don't know about birth... so always listen to that voice inside you, no matter how soft, it is always there to guide you. So the next question would be, how do you know if your care provider is supportive of natural birth??? I will be happy to help you find one, and accompany you on your journey to parenthood; one of the many supportive roles I take on as a doula. Baby Showers and Holidays Coming Up! Still not sure what to get the mommy-to-be? 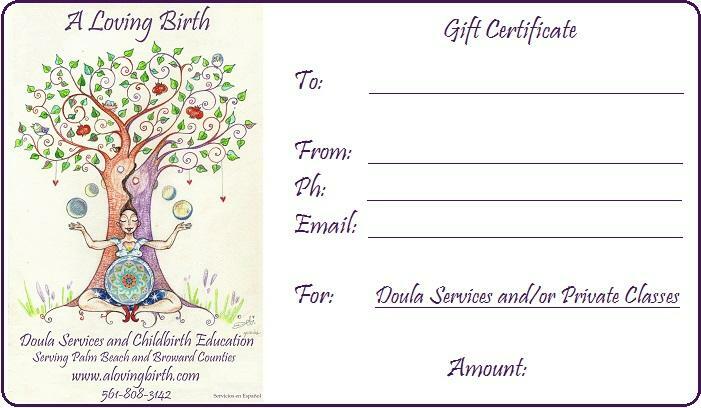 What a better gift than the support of a doula and/or informative and inspiring childbirth education classes! To purchase a gift certificate please email zeresh@alovingbirth.com or call 561-808-3142.